Final Tally: 21 issues to complete the run. Let me start by saying it’s sheerly coincidental that the month where I started to explore Spider-Man as a member of the Fantastic Four after the death of Human Torch/Johnny Storm I happen to pick-up two ASM comics that feature a Spider-Man/Torch crossover. At this point in the comics, Spidey and Torch have not yet become friends, and like two teenagers vying to be the big man on the superhero campus, they are adversarial, though never truly combative with each other. 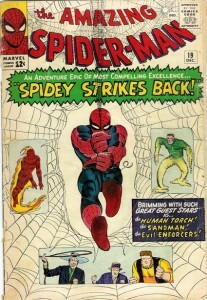 However, now with #8 and #19 in my collection, I own three of the earliest ASM Spider-Man/Human Torch stories (the third is #17 which I picked up a few years ago). The May haul negates some of the initial shock and awe associated with my April haul, when I cracked single digits for the first time with the acquisition of ASM #9. It was a short-lived emotional milestone as ASM #8 now gives me two single-digit issues. I guess collecting is funny that way – you go 20 years without sniffing the top 10 and then in back-to-back months you hit paydirt. Granted #9 is the better “get” in terms of value and significance – anytime you can get your hands on a decent low grade copy of the first appearance of a classic villain like Electro, it’s a big deal. 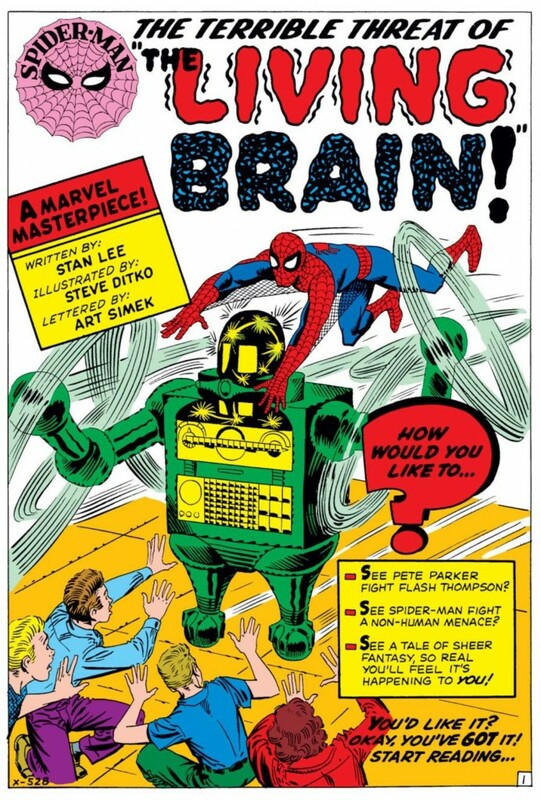 ASM #8 features a Spidey confrontation with the Living Brain, a robot run amok that looks suspiciously like the “Danger WIll Robinson” creation from Lost in Space. But #8 is now the oldest issue in my collection, so it while it’s not as historically significant as ASM #9, it’s an important issue to me. Plus, #8 also shows Peter Parker getting the better of his high school tormentor Flash Thompson for the first time – so excelsior to all of the former high school wallflowers out there! Meanwhile, these two issues marked the first time I’ve gone “off the grid” for an online acquisition – i.e. I set-up the purchase outside of the comforable and regulated environment of a sanctioned retail web site (like eBay). And let met tell you, it wasn’t that scary. 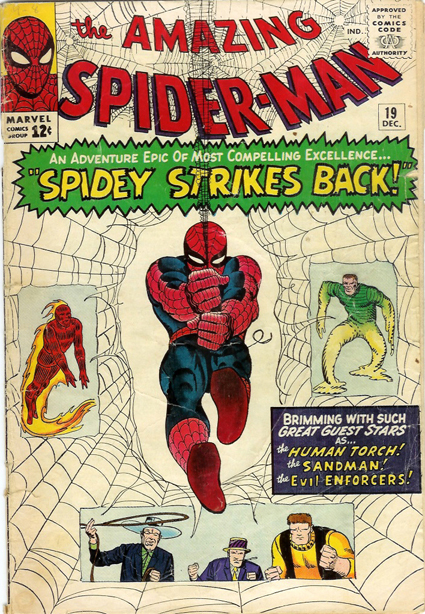 The seller in question had dealt with me earlier for an eBay transaction and we got into a bit of a back-and-forth via e-mail where he mentioned he had a pretty large run of Amazing Spider-Man comics he wanted to unload. He sent me a list of what he had, we talked on the phone (a bit of a feeling-out process I guess), and after getting a couple of comic scans via e-mail, a deal was brokered. I’ll admit, I was initially paranoid and anxious just because even with some of the protections you get from using paypal, there was a bit of a “wild west” feel to this. The seller was authorized charge me whatever he wanted, I could negotiate a bit if I so choose and I didn’t have to worry about any other buyers out there swooping in at the last second and out-bidding me. While that may seem like an ideal situation, as someone who hasn’t really operated like that prior to this purchase, it was ever so slightly unnerving. I’m obviously at the point where if I get burnt on a purchase, the stakes are significantly higher. I can’t just laugh off my naiveté like I do now with some of the purchases I made when I was in junior high that only cost me $5 or $10 tops (though trust me, spending even that small amount of money and not getting what you want is devastating for a kid). When you’re logged in to eBay, they’re very explicit about warning people about the dangers of going “off the grid” for a transaction. So the timid “rules are there for a reason” side of me wasn’t able to breathe easier about this purchase until the comics were in-hand and as promised. And they were. While I have no qualms about dealing with this specific seller “off the grid” again (we’ll have to see if he can come through again in June), I’m on the fence about going this route with other sellers in the future, especially when I’m faced with getting the last few issues. A reader of Chasing Amazing recently alerted me to some online forums that specialize in buying and selling, and I guess I HAVE to consider anything at this point that will affordably help me achieve my collecting goals here, but I’m still a bit skittish. While you’re always entitled to some protections as a buyer when you establish a solid transaction papertrail via e-mail and use a site like paypal, I know I’m not going to want to get into some protracted legal dispute with someone if they’re not as forthcoming and honest as this one particular seller. I’ve had some guys attempt to rip me off in the flesh, so an extra layer of anonymity provided by a computer and a screen name makes it even easier to get ripped off. But for the time being, I’m going to be thankful for the seller who set me up with my May haul, who may or may not be reading. 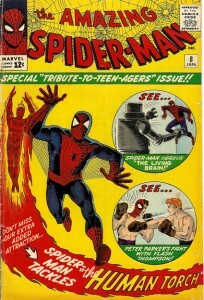 Thanks to him, I’m two issues closer to the run, and I know own my earliest issue of Amazing Spider-Man. It just took a little discomfort and anxiety to get there.